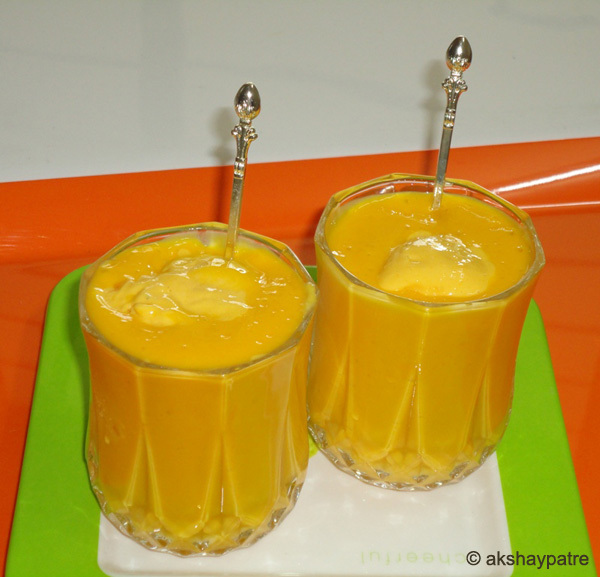 Mango mastani recipe - I never leave a chance to sip mango mastani at Sujatha Mastani, Sadashiv Peth, Pune. Whenever we go to Lakshmi road for shopping, it is our favourite spot to relish the creamy mango mastani and we enjoy it thoroughly in true sense. During summer this mastani parlour is always over crowded and sometimes, to get the seat, we have to wait for at least half an hour and in the end when we get the chance it is worth waiting. 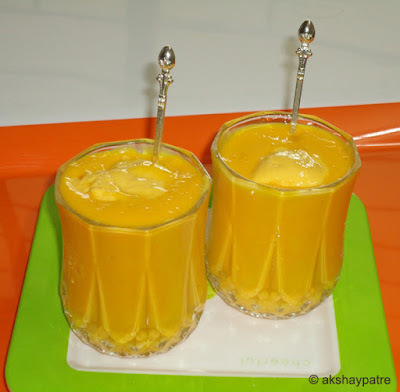 Off late, I have started to prepare mango mastani at home because we can't go so far every time to relish this delicious drink. Mangoes are still available in the market. Alphonso, kesar, payari are good varieties of mangoes which gives thick and sweet pulp which is ideal for preparation of mastani. Now I explain you about the mango mastani in brief. It is nothing but thick chilled mango milk shake and topped with a scoop of mango ice cream. Usually Mastani is served in a large glass with a straw to sip the milkshake and spoon to eat the ice cream. If you haven't tasted mango mastani yet, try it once and you will be amazed by its taste. Wash and peel the mangoes. Cut them into small pieces and transfer to a bowl. 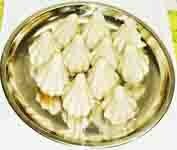 Place this bowl in the refrigerator for an hour. Allow the mango pieces to chill. 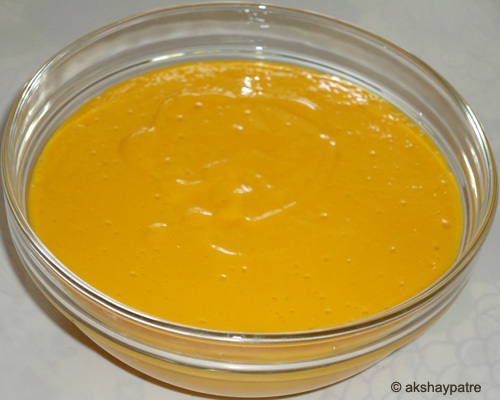 While making the mastani, remove the mango pieces from the refrigerator. Put the mangoes and sugar in a mixer jar. Place the milk in the refrigerator and chill it. Remove the chilled milk from the refrigerator and add it to the mango pieces and sugar. Blend it to a smooth paste to make a thick milk shake. Transfer it to a large bowl. Place this bowl in the refrigerator if you want to chill it more. Pour the milk shake in the serving glasses keeping enough space to put the mango ice cream. Put 2 scoops of mango ice cream on the top and serve immediately. 1. Wash and peel the mangoes. Cut them into small pieces and transfer to a bowl. Place this bowl in the refrigerator for an hour. Allow the mango pieces to chill. 2. While making the mastani, remove the mango pieces from the refrigerator. 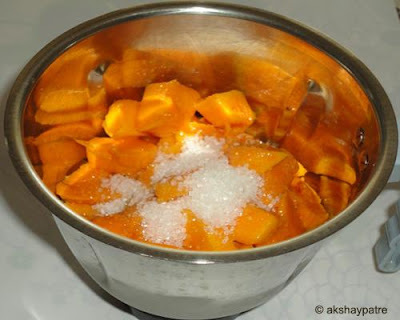 Put the mangoes and sugar in a mixer jar. 3. Place the milk in the refrigerator and chill it. 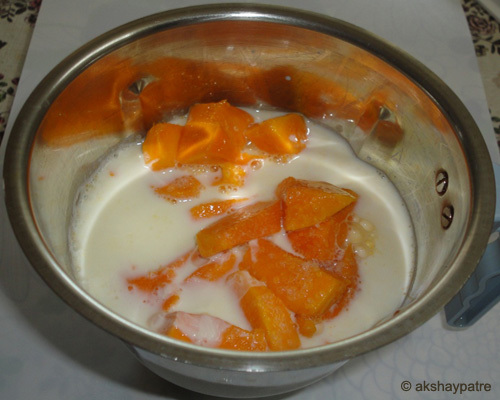 Remove the chilled milk from the refrigerator and add it to the mango pieces and sugar. 4. Blend it to a smooth paste to make a thick milk shake. Transfer it to a large bowl. Place this bowl in the refrigerator if you want to chill it more. 5. Pour the milk shake in the serving glasses keeping enough space to put the mango ice cream. Put 2 scoops of mango ice cream on the top and serve immediately. We have a similar dessert in Brazil but with papaya.